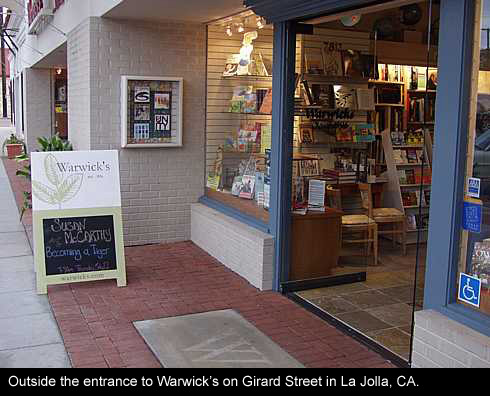 On Thursday night I went to attend Susan McCarthy's talk and book signing at Warwick's book store in La Jolla. 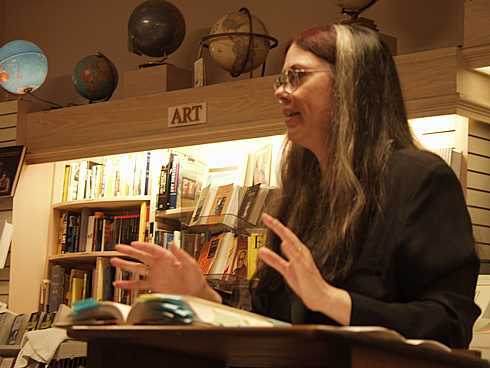 McCarthy (daughter of MIT/Stanford AI pioneer John McCarthy) is a biologist and science writer. Her new book is Becoming a Tiger, a collection of essays about how baby animals learn to live in the wild. 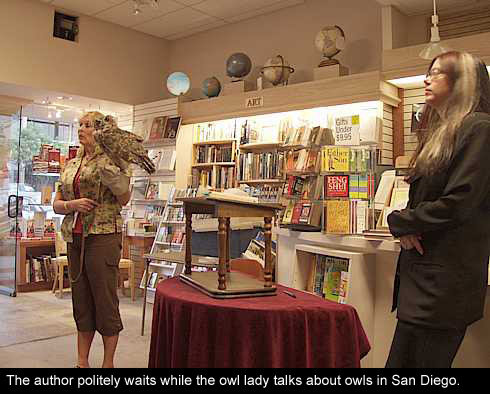 Instead of the author's reading beginning right at 730pm as expected, there was a surprise guest, an orphan owl and its keeper, a woman from "Project Wildlife" in San Diego. She spoke for about fifteen minutes (supposed to be five, but folks kept asking questions). There's no shortage of owls in San Diego County, however they are threatened by reduction in habitat due to constant human encroachment. "As long as there are rodents, owls thrive." Owls have the largest eardrums of any bird; the earlike things on the tops of owl heads are not ears but tufts of feather; the actual ears are located on the side of an owl's head, and they're not symmetrically placed (one is higher up than the other -- this aids in locating prey). Not quite The Exorcist, but close: owls can rotate their heads 270 degrees. Owls typically live 18 years; this one was 10; at some point in the past it had flown into a glass window and in the process lost vision in one eye. 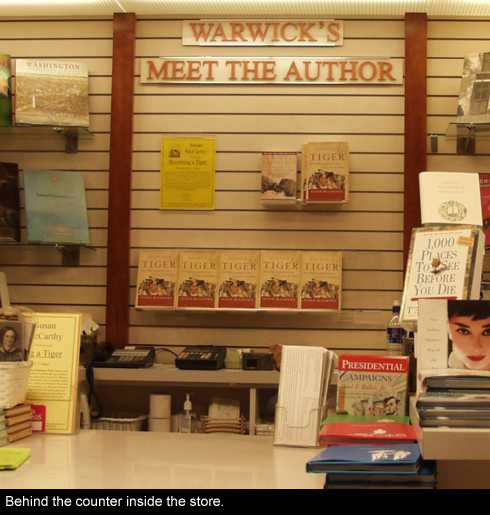 When the Warwicks lady introduced author Susan McCarthy, she mentioned that McCarthy is a frequent contributor to Salon.com, which, the Warwicks lady mentioned, was her "favorite e-zine". She pronounced "e-zine" with a long I: ee-zIne. Never heard it pronounced that way before. Learning is the ultimate combination of nature and nurture, in which a growing animal applies its powers of intelligence, curiosity, perception, and memory to the world around it, again and again, and ends up with knowledge and skills it did not have before. No newborn animal is a blank slate and no newborn animal has a complete instruction animal. In Becoming a Tiger she provides a survey, from many different sources, of how different kinds of animals, from owls, ravens, and dolphins, to chimpanzees, bonobos, and, of course, tigers, learn from infancy in order to survive, thrive, and live to reproduce during their lifetimes. I found it interesting that McCarthy was able to so seamlessly move from impromptu exposition to reading a selection from her book to continue to make a point. Some authors at book-signings/lectures are not as good at this, and slow down the talk while fumbling to find particular passages. McCarthy was prepared. 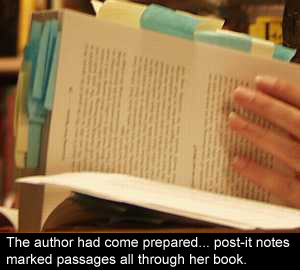 Check out the post-it note bookmarks. She also had several pages of notes to refer to. When authors read from their own material, I always find it interesting to see whether they paraphrase, insert new words here and there, or read verbatim. (I've talked about this before -- see the Simon Winchester blog entry.) McCarthy sometimes read verbatim, sometimes removed words or phrases here or there, and sometimes inserted words not in the text. During the Q&A I asked her whether she owned any pets and had she observed any surprising behavior or learning on the part of the pets. She said she had two dogs, and then listed a long list of animals she's owned over the years, including "kidnapping animals from the wild" when she was a teenager (somethign she'd never do now, she said). She then recounted an anecdote about how at one point in high school she had rescued a bunch of baby possums, and that someone had made a special coat for her that had a bunch of pockets in them, one for each possum, which she took to school with her. (I am reminded of the guy on Star Trek who sold tribbles from his many pockets . . . ) "No teacher came up to me," McCarthy noted, "and asked me, 'Why are your pockets squirming?'" She also said, in response to another question about animal intelligence, "I loved my possums but they didn't really seem to be mental giants." 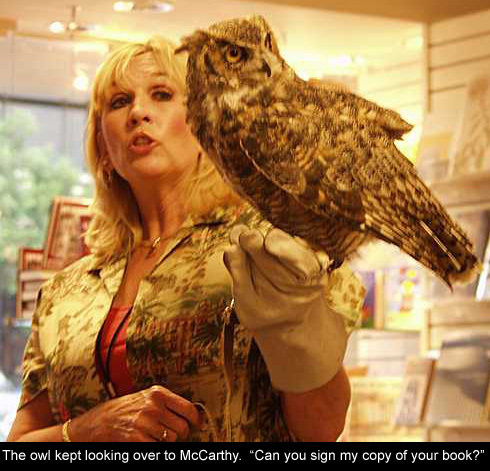 "The one animal that puzzles me," McCarthy mentioned at one point, "are octupuses." The mystery? Octopuses are good learners, and yet, they have short lives. Why bother being endowed with a good learning ability, she wondered, if the animal doesn't live very long? Her theory: octopuses have very sensitive, complicated bodies that go through major phases of change as they grow up. They start out as eggs, become plankton-feeding larvae, and if they survive, they grow quickly and change to feeding on crabs and clams and other prey at the ocean bottom. Looking at the stories of animals learning -- and not learning, which can be even more illuminating -- I was struck by the way learning interlocks with animal feelings and personalities. Rivalry, shyness, impatience, the desire for freedom and control can be as influential in the learning process as simple brainpower. Examples include the observations that birds learn song better if they get to push the buttons. Parrots learn better if they watch the competition, and apes learn more from watching someone else being taught than they do from being taught themselves. Animals prefer to try hard new things when no one is watching, whispering and mumbling the language skills they are mastering. You should learn language as young as possible; it may be more important to interpret the communications of others (such as alarm calls) than to learn to make communications yourself; and most animals aren't nearly as interested in communicating with us as they are with each other. When they do want to communicate, it's usually not about the curriculum we had in mind. It's a great book. Go buy a copy.